Now that I have such a fantastic resource of U.K. yummies within easy reach, you might want to get used to seeing a few more British things on NEAROF!, starting with these Tunnock’s Milk Chocolate Tea Cakes. 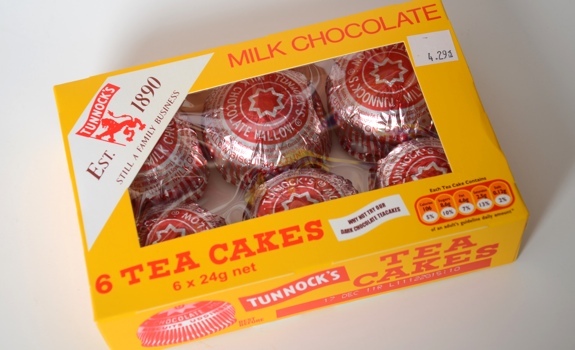 A box of Tunnock’s Milk Chocolate Tea Cakes, with its decidedly retro look. The Pitch: “A delicious biscuit base topped with marshmallow and covered with real milk chocolate.” Sounds a little bit like what I’d call a wagon wheel, though these are smaller and more bulbous, maybe more like a Viva Puff. These little beauties hail from Uddingston, Scotland. The Look: Spectacularly old-school packaging. Subscribes to the theory of “If it ain’t broke, don’t fix it.” Design nerds will understand what I mean when I say it has a spot-colour look. I’d place it in the 1960s, with some modifications for present-day requirements. (Nutritional info, a “Suitable for Vegetarians” label, etc.) 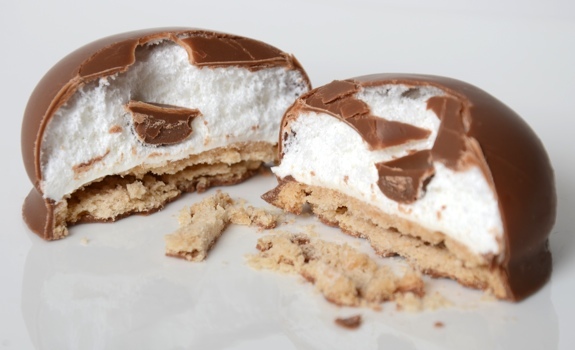 The teacakes are round domes of mallow on top of a cookie, then coated in milk chocolate. They’re wrapped in retro foil with red-ink printing. 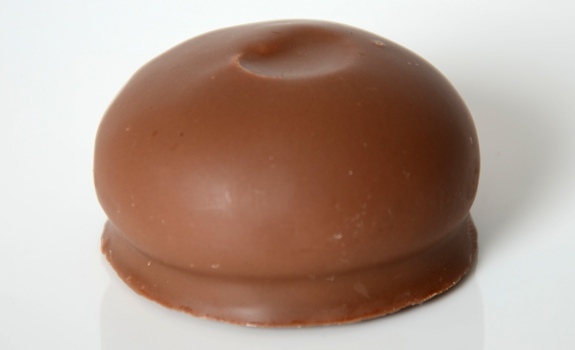 The Taste (#1): For a marshmallow centre, it isn’t all that springy. Sweet, with more crunch than I thought there’d be, courtesy of the cookie base. Chewy, too. Considering how light they are, I thought they’d be more airy. The Taste (#2): But wait! I just sampled a second one, and it was much more moist and soft. The top collapsed around my teeth as I bit into it. Nice mix of soft, smooth and scratchy textures. Still very sweet, but the cookie is less dried out in this one. The first teacake must have been a dud. They’re not past expiry date, so I’m not sure what happened with teacake #1. A tea cake, cut in half. Note the layers: cookie, mallow, chocolate. Cost: $4.29 for a six-pack at British Pantry in Calgary. Availability: Very limited around here. Look for them in import shops. I think I spotted some several months ago at the new U.K. import room at Hub Cigar in Edmonton. Nutrition? : Per tea cake (24 grams): 106 calories, 4.6 grams of fat, 50 mg of sodium, 0.6 grams of fibre, 1.2 grams of protein. Vegetarian friendly: Yes, surprisingly. That’s what the box says. One of the main ingredients in marshmallows is typically gelatin, but it’s nowhere in the ingredients listing. The verdict: I like it. A bit too sweet, yes, but the chocolate and sticky mallow should go perfectly with a hot cup of tea. If you can’t handle sweet sweets, you have no business mucking about in U.K. import treats. 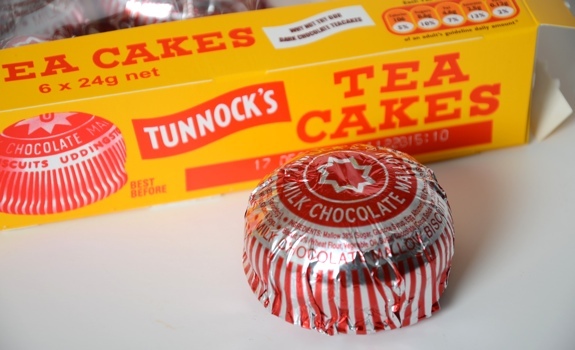 To my Canadian mind, Tunnock’s tea cakes sort of look like large Viva Puffs. It’s actually not marshmallow, but Italian meringue. Hence the much softer, lighter texture.